With the recent change to mandatory reusable plastic bags in our supermarkets, it has been very easy to look back on plastic bags as the most harmful option in terms of environmental impact. Paper bags, with their biodegradable materials and recyclable disposal, are often considered to be the environmentally friendly choice when compared with their plastic counterparts. In fact, this is a common misconception; overall paper bags are more harmful to the environment than disposable plastic ones. Production of paper bags requires significantly more resources than plastic bags. Paper bags require roughly 4 times more water than the manufacture of plastic, and produce 3.1 times more greenhouse gases. Additionally, plastic bags are created from polyethylene, which originates as a by-product of refining natural gases. This material would otherwise be burned off and discarded with no positive use. This is in stark contrast to paper bags, which require large quantities of paper, the source of which originates from forest clearing. Another important aspect of sustainability is the ability to reuse a bag as many times as possible before it needs to be disposed of. Paper bags tend to fall behind their plastic competitors in this regard, as they are not waterproof and can tear easily under moderate weight. 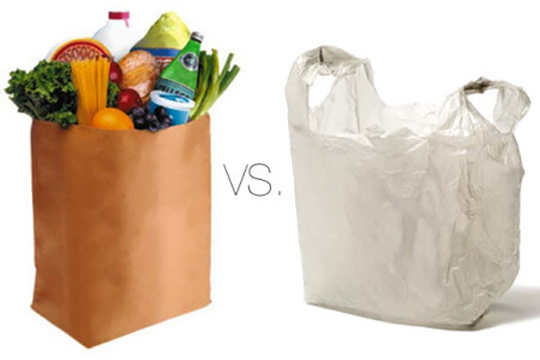 Those paper bags that are designed to stand up under more weight represent a much larger usage of paper resources. Conventional plastic bags outperform paper bags in this regard, as they can be stored easily without compromising the bag, store a wider variety of goods successfully, and do not tear as easily under pressure. Because paper bags are biodegradable, it is easy to assume that they are much easier to recycle than plastic bags, but this is not the case. Paper bags weigh roughly 8 times more than plastic bags, meaning they are significantly harder to transport due to increased volume. For example, transporting 2 million of paper bags to a recycling facility will require 7 times as many trucks as 2 million plastic bags! The emission impact of this difference becomes massive in the long run. Additionally, plastic bags do not suffer from ‘down cycling’, which means they can be reproduced from the same materials indefinitely. Paper has a limited lifespan because its fibrous structure breaks down towards the end of its recyclable lifespan. Lastly, the proper disposal of our bags contributes greatly to our opinions of them. Most people have seen plastic bags as an issue because when littered and disposed of irresponsibly, plastic bags harm wildlife. However with proper disposal, they represent a safely reusable resource. Additionally, the irresponsible disposal of paper bags is actually a devastating contribution to greenhouse gas emissions. Because paper bags are made from biodegradable materials, people often assume that they are harmless when placed with landfill garbage. However this is another misconception – biodegradable materials do not properly break down in landfill. Biodegradable materials need an environment rich in oxygen to break down properly, which they do not have in landfill. Without this, they break down into methane which is one of the most harmful greenhouse gases in our atmosphere. Regardless of your bag preference, there are a few solutions you can use to minimise your environmental impact. Try and get the most life out of your bags, and don’t be afraid to use ripped or torn bags to carry clothes and other light objects. When it comes time to dispose of your bags, do so responsibly. Or better yet, consider options that cut down on your bag use altogether. Remove bin liner bags from your bins, use backpacks and cloth bags as often as possible, and hand carry your shopping when it is small volume. Small changes like this can have a huge impact on our environment.